Nuclear contamination in former USSR: Radioactivity in Muslomovo on Techa River near Maiak plutonium plant. Strange illnesses in one of the most contaminated towns in the world challenge what we think we know about the dangers of radioactivity. 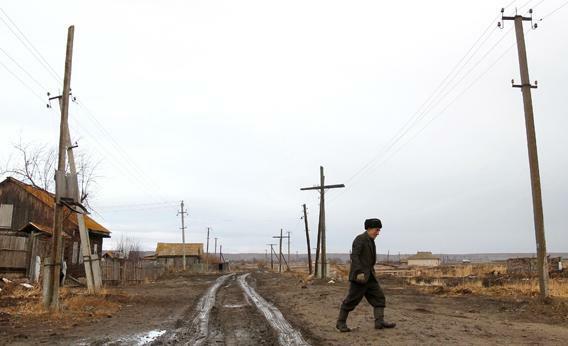 A man walks next to his old house in the village of Muslumovo, Russia. The village is located on the banks of the Techa river in Russia’s Urals, one of the country’s most lethal nuclear dumping grounds. In pop culture, irradiated wastelands are fascinating. If a person can’t afford a packaged tour of the Chernobyl Zone, he or she can buy an avatar on S.T.A.L.K.E.R., a popular online game where players in a virtual Chernobyl Zone battle zombies, druids, and invisible plumes of contaminants. Part of the fantasy is surviving alone in an abandoned place no longer fit for the living, but the sad fact is that there are irradiated zones that are fully inhabited, and have been since the first years of the nuclear arms race. Despite a media culture enthralled with nuclear accidents, the cameras generally turn off after the first clouds of radioactive vapors dissipate. What do we know about communities living on contaminated terrain? Two years after the meltdown of three reactors in Fukushima, Japan, the World Health Organization forecasts that there will be no significant rise in cancers among people living nearby. These projections are based on guesses from models calculated from prior studies, mostly of Japanese people who survived Hiroshima and Nagasaki. Yet when Japanese scientists and inspected the bodies of 38,000 children living in the Fukushima Prefecture, they found 36 percent had abnormal growths on their thyroids a year after the accident. There’s no work in Muslumovo. A person either commutes 60 miles to the industrial city of Cheliabinsk or farms a patch of land of the long-defunct Muslumovo collective farm. Marat farms, living off the land—a term that takes on new meaning in Muslumovo, where in 2008, an American team found domestic interiors registering radiation at 40 times above the background level. After we pulled up at Marat’s house, his teenage son silently trailed us. Noticing a twitch in the boy’s step, I turned to look at him. His mouth drooped and fingers twisted, as he mouthed a stuttered greeting. Marat explained, “This is Kareem, nash luchevik,” meaning “our radiant one,” said in an off-hand manner, as if every family has a luchevik. Marat showed me to a table full of food—veal, goose, salads, beets, potatoes. Murat wanted to eat first and talk later “in Tatar tradition.” I didn’t want to eat. It was 9 .a.m. and I wasn’t hungry, but mostly I wasn’t brave enough to ingest his homegrown food. This was the elephant in the room, about which neither he, nor I, nor his quietly attentive wife spoke; their food, which they must eat every day, must live on, was too radiated for me to eat for just one meal. Increasingly agitated, Murat rushed out to light up his sauna, and pulled out a bottle of vodka, offering me some. I turned the sauna and vodka down too. Soon, a neighbor arrived. The two men started to drink. In a few hours, Murat was howling drunk. There is a legal contest going on over the health of the people of Muslumovo: whether they are sick and, if so, ill from the radioactive isotopes dumped in the river or from poor diets and alcohol abuse. Medical evidence has been contradictory. In 1959, Soviet scientist A. N. Marei wrote a dissertation in which he argued that the Techa villagers were in poor health because of their poor diets. In 1960, in contrast, local Soviet officials linked the river-dwellers’ illnesses to the contaminated river. This debate between nature (radiation) and nurture (lifestyle) has been going on a long time. For Soviet leaders, the river dwellers were a unique opportunity in the history of health physics—what scientists call “a natural experiment” that promised to answer an important civil defense question about how to survive a nuclear attack. In 1962, the Cheliabinsk branch of the Soviet Institute of Bio-Physics, called FIB-4, started conducting regular medical exams of the Muslumovo population. FIB-4 doctors invited village children playing on the streets to a clinic room to take blood samples. In Cheliabinsk, they set up a repository of irradiated body parts: hearts, lungs, livers, bones. They started a collection of genetically malformed babies who died soon after birth, each infant preserved in a two-quart glass jar. A Dutch photographer, Robert Knoth, visited the repository and saw hundreds of babies in jars. He photographed one infant with skin like patched, rough burlap. Another boy had eyes on top of his head like a frog. During the examinations, doctors did not inform the villagers of their exposures or of diagnoses of radiation-related illness. The trope of ignorant, genetically deficient, and drunken villagers is a common one in Russia. In the southern Urals in the past few decades, the cliché has been useful in glossing over the human suffering connected to uncontrolled dumping into the Techa River. In conferences debating the number of victims of the Chernobyl accident, officials who draw paychecks from nuclear lobbies make similar arguments about alcohol abuse and “radiophobia”—stress-related illnesses caused by fear of radiation. It would be a mistake, however, to allow the longstanding politicization of medical studies to overtake this very important, yet overlooked, place for our understanding of radiation’s effects on human bodies. Reprinted from Plutopia: Nuclear Families, Atomic Cities, and the Great Soviet and American Plutonium Disasters by Kate Brown with permission from Oxford University Press USA. Copyright © 2013 Kate Brown.